Lanxess sold off last year within a broad-based chemicals slump. However, investors ignored the multiple built-in safety buffers that make further profit growth a virtual certainty. Lanxess attracted even Berkshire Hathaway in 2017 and we can now buy it at a much lower price. Lanxess (OTCPK:LNXSF) (ADR ticker OTC:LNXSY) is a German specialty chemicals manufacturer with a EUR 6B EV, based in Cologne. Last year, as the German automotive sector tanked due to its dependence on the weak Chinese consumer market, the WLTP issues, the trade war and tariff threats, it dragged down the German chemicals sector as well that traditionally is highly intertwined with the large automotive industry. In addition, an unusually dry summer caused an extremely low level of the river Rhine, along which most German chemical industries are located, profiting from a safe and cheap way to ship its products down to the North Sea. Given the low level of the river, more product needed to be trucked, causing higher expenses. Moreover, Brexit caused another logistics headache and a substantial build-up of working capital. Finally, the anticipation of a global slowdown made a highly cyclical sector like the chemical industry a very unpopular investment. Lanxess' market cap roughly halved during this sell-off, despite being the only major German chemicals manufacturer that actually met its guidance. It excellently managed the low Rhine issue without suffering any meaningful loss. After selling out of its Arlanxeo JV, it has drastically reduced its reliance on the automotive industry. Finally, thanks to a large transformation process, it has actually a lot of levers to pull to compensate for lower growth and increase earnings even in a sluggish environment. So this baby was thrown out with the bath water, as you will see in more detail below. 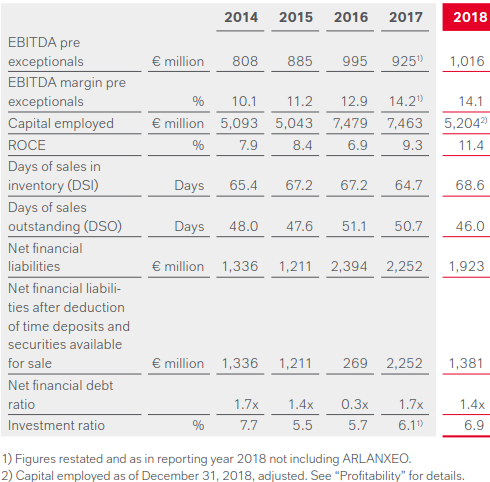 Despite being much less affected by last year's issues than many of its peers, Lanxess is trading for just 6x EBITDA pre-exceptionals (its key measure of profitability). If it traded for a similar multiple as its larger German peer BASF (OTCQX:BASFY), its stock would go up 45% immediately. Over the longer term, the upside is even better, as we will see below. A potential catalyst could be a major acquisition. Lanxess' CEO has demonstrated to be a smart capital allocator with a value investor mindset and made sure he would enter a potential downturn with a strong balance sheet and plenty of dry powder. Moreover, Lanxess could profit from the sale of hidden assets (see Currenta below) and/or reap a windfall profit from its recently announced lithium extraction JV with Standard Lithium. If any of these three happened, the market would likely appreciate how different and how much safer the Lanxess story actually is compared to the broad chemicals sector. EBITDA pre-exceptionals (or simply "EBITDA pre") is Lanxess' key measure for profitability, as sales are often influenced by volatile raw material prices. Importantly, the exceptional items excluded from EBITDA pre have shrunk to almost nothing in the most recent quarter and the company guided to an even smaller impact in 2019, which increases earnings quality, effective cash flows and validates the exceptional nature of the items excluded in previous years. In 2004, Lanxess was spun out of Bayer (OTCPK:BAYRY), the German chemicals and pharma giant. It initially focused on specialty rubber production, increased its debt to expand its business there and was later hit by the declining oil price, while the global specialty rubber production overcapacity lead to sharply declining sales prices. In 2014, Matthias Zachert, the current CEO, came in and started a total transformation of the company. Zachert had already been CFO at Bayer and Lanxess before and knows the company very well. He immediately made sure Lanxess got an investment grade balance sheet to lower its cost of capital (8.5m shares issued at EUR 52, by pure coincidence very close to today's price), took out EUR 150m of costs, started another restructuring plan aiming at further EUR 150m savings within 2019 from the closing of underperforming plants and refocused Lanxess' portfolio on high-value-added specialty chemicals. In 2016 Chemours’ (CC) Clean and Disinfect business was acquired for about EUR 210m (~10x EBITDA), with EUR 10m of synergies expected by 2020. In 2017, Lanxess acquired the U.S. company Chemtura for ~EUR 2.4B (~10x EBITDA). Chemtura immediately transformed Lanxess into one of the largest global providers of flame retardant and lubricant additives. Expected synergies by 2020 are ~EUR 100m and have so far been realized ahead of plan. Chemtura will also further expand Lanxess' footprint into faster-growing North America and Asia Pacific markets and further diversify Lanxess’ end market customer industries. The mid-sized specialty chemicals markets are much less competitive and products are often tailor-made for customers. The customer base is highly fragmented, chemicals costs are only a tiny fraction of the customer's total production costs, there are relatively low variable costs once the production plant is set up and R&D is done, so that incremental margins are high. Pricing power is better, margins are higher. By creating a more balanced portfolio, Zachert wants to make sure Lanxess becomes less dependent on economic cycles, which in itself should lead to a multiple expansion. Margins and EBITDA pre increased, while ROCE grew substantially. While the market reacted euphorically when Zachert became CEO and certainly priced in a quite optimistic view, the new leadership has consistently overdelivered. Lanxess has set a 2021 target of achieving EBITDA pre-exceptional margins of 14-18% across business cycles. This would indicate further improvements from here. Management has earned strong credibility and is targeting further cost synergies coupled with organic and inorganic growth. Lanxess has yet to reap the full benefits from the Chemtura acquisition. 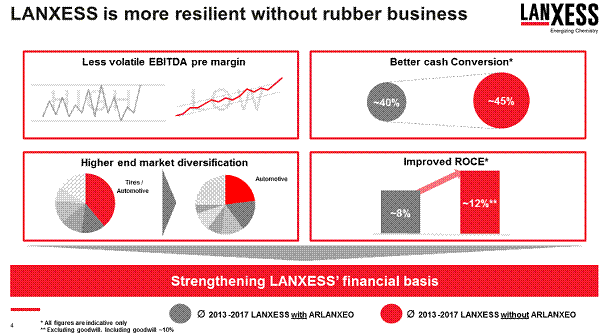 Lanxess recently completely disposed of its remaining 50% JV stake in Arlanxeo (a synthetic rubber producer), with net cash proceeds of EUR 1.4B. This reduced net leverage to about 1.4x EBITDA pre and significantly increased financial flexibility for potential M&A. Already at the end of 2017, Lanxess had announced EUR 400m of investments in organic growth until 2020. These will add to earnings over time. Sharply reduced dependence on the highly cyclical automotive sector. Brexit preparations and an exceptionally low level of the river Rhine caused severe logistics headaches and a working capital increase in 2018. These issues likely won't repeat in 2019 and beyond and enable better cash conversion. Ongoing 5% share buyback program. Bayer will sell its 60% stake in the Currenta JV it owns together with Lanxess (40% owner). The JV is said to be worth between EUR 1B and over EUR 2B. If Lanxess sells out, too, it will get between EUR 400m and EUR 800m of cash (~10-20% of its market cap). If not, the market might still appreciate the additional margin of safety provided by this asset which is carried at zero value on Lanxess' balance sheet. According to Zachert, it takes 10 years to change a company and hence there are 5 years to go. There can be little doubt that the 10x multiple paid for Chemtura and Chemours would be appropriate for Lanxess as well as a private market valuation, especially given the strong management, highly credible growth targets and already achieved successes. The company has a strong balance sheet and even on a more traditional metric is trading for an undemanding P/E valuation of 14x. On an EV/EBITDA pre basis it trades for just 6x. The far larger and slower growing BASF is trading for an EV of EUR 80B, corresponding to 8.2 x EBITDA (2019e) of EUR 9.7B and its share price corresponds to 14 times EPS (2019e) of EUR 4.79. So the market is attributing a lower multiple to Lanxess than to BASF, despite the former's much better growth profile and the high likelihood of a future in closer proximity to other highly diversified specialty chemicals manufacturers (which usually trade at premium multiples - see Croda (OTCPK:COIHY) or Fuchs (OTC:FUPEY). Investors can now buy into the story at the same price as at the beginning of the transformation (when shares were issued at today's price), but with the benefit of the certainties and insights into the soundness of Mr. Zachert's strategy gained in the meantime. If Lanxess traded at the same EBITDA multiple as BASF, its stock would cost EUR 74 today (45% upside, based on EBITDA pre of EUR 1,000). 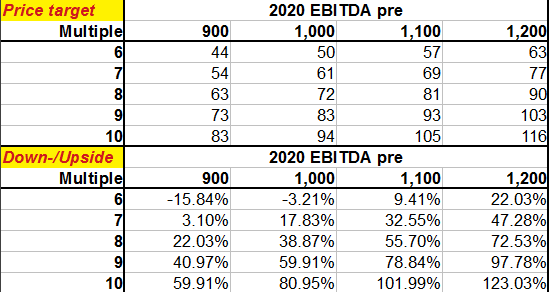 With modest growth next year (on a per-share basis almost certain thanks to buybacks) and a full valuation of 10x, we get 102% upside (based on EBITDA pre of EUR 1,100). 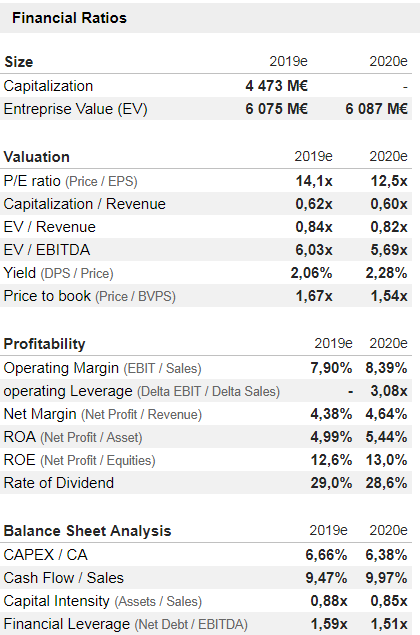 If 2023 EBITDA was not much different from the start of the journey (and lower than today's), i.e. around EUR 900m, we would incur a total loss of just ~EUR 4/share or 8% (after adding ~EUR 4 of dividends). 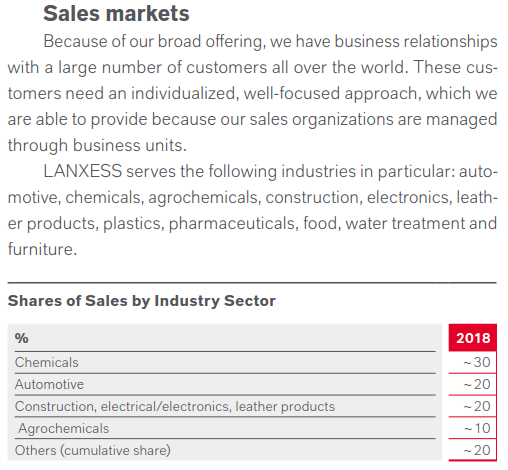 This alone highlights how bearish the market has become on Lanxess, despite the transformation being perfectly on track and management continuing to deliver 100% on its guidance. Far more likely is some further growth and a modest multiple expansion: In this case we would get at least decent returns with potentially even excellent returns with a greater multiple expansion. 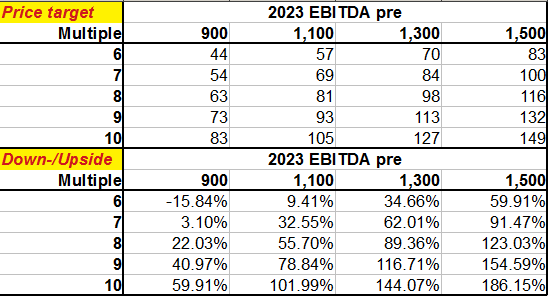 E.g., if the next 4 years produced only 10% total EBITDA growth to EUR 1,100, together with a still low 7x multiple, our total return would already be ~40% (including dividends). Overall, the risk/reward is very compelling. Therefore, I believe the company is far too cheap at its current valuation and established a long-term position during the sell-off late last year to profit from profitability and predictability improvements over time. Lanxess should experience a multiple expansion coupled with at least decent earnings growth over the next few years and stock returns will follow. The Lanxess story has attracted even Berkshire Hathaway that holds 5% of the company. The stake was accumulated in two steps: The first 3% before the end of May 2017 and the second 2% between June and December 2017, i.e. likely always at prices above EUR 60 at the very least (~19% higher than today). 1) My thesis mainly depends on a multiple expansion, which can happen - or not. The shift towards a more diversified portfolio should lead to more predictable earnings over time and, probably, a higher multiple. However, there is no guarantee. 2) You may need to be patient. Lanxess' transformation and smart diversification strategy has sharply reduced its reliance on any particular sector. However, this will likely be appreciated only over time by the market, as earnings demonstrate lower volatility. If the general market tanks, I fully expect Lanxess to tank as well. The German stock market is considered to be highly cyclical and mostly fuelled by foreign investors who tend to jump in with both feet during economic upswings, but also sell out regardless of fundamentals when macro headwinds loom. However, any significant price slump would likely trigger significant buybacks and thus benefit long-term shareholders. 3) Lower market multiples could enable M&A, although acquisitions can become a disaster. So far Zachert has done great, but next time could be different. 4) Lanxess might not sell its Currenta stake and after all there might not be any meaningful earnings from the lithium extraction JV. This would remove potential catalysts for share price gains. So, again, patience may be required. 5) A large pension deficit. 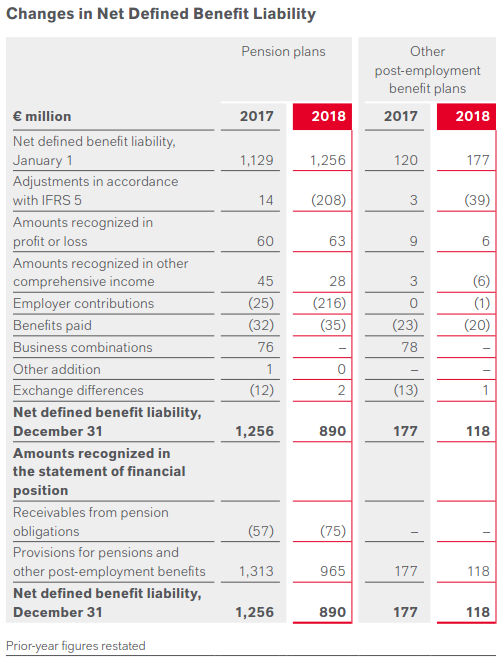 Like many old, large employers, Bayer carries a burden of legacy defined benefit pension plan and the spun off Lanxess has take its share of it. Especially in the past few years the low-interest rate environment impacted return assumptions of pension assets and led to additional payment obligations which consumed cash. While still a risk going forward, in the near term further strong interest rate declines across the globe are unlikely, so that some of the liability might even disappear with rising interest rates. 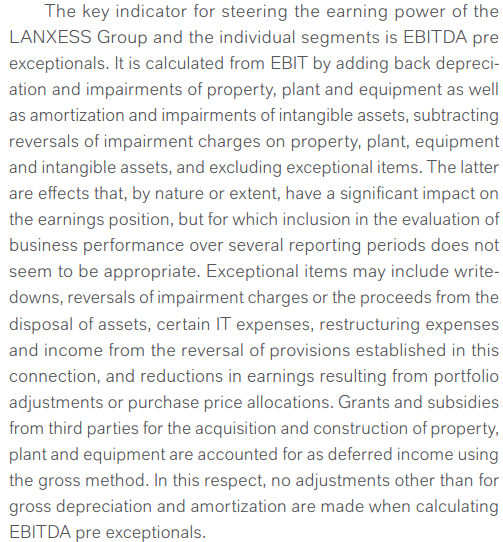 When Lanxess authorized its EUR 200m share buyback, the company also reduced its pension deficit by EUR 200m. This was the right thing to do, as investors will be more inclined to pay a higher multiple with a lowered pension risk. - In any case, this liability is something to keep an eye on. Aside from these issues, I see very little fundamental risks with Lanxess. So if you are able and willing to wait, Zachert's strategy will continue to transform the company into a more stable, more predictable and valuable asset. As far as the potential downside is concerned, as my tables above have shown, we barely need the company to trade for a depressed multiple below its peer group and only constant EBITDA to break even over the long term. Since management so far hasn't shown any sign of weakness, I think the pessimism is far overdone. I would obviously reconsider my thesis if Zachert did some stupid acquisition or squandered money on projects with unattractive returns. If you want to continue following the story, full and timely coverage of Lanxess and much more detail can be found in my subscriber service Stability & Opportunity. S&O is all about identifying certainties, doubts and ultimately probabilities of success through in-depth analysis of a narrow selection of potential investment ideas. Subscribe now to Stability & Opportunity and get access to a treasure trove of independent research! Disclosure: I am/we are long LNXSF. I wrote this article myself, and it expresses my own opinions. I am not receiving compensation for it (other than from Seeking Alpha). I have no business relationship with any company whose stock is mentioned in this article.